Sydney International School believes in activity based education and follows the methodology where an intellectually challenging academic programme both inside and outside the classrooms is offered. Our goal is to ensure that every pupil gives his or her best and this is achieved through small class sizes of 15 students, and close monitoring of each student’s progress. Academic standards are high and are fostered through a sense of purpose and a positive working environment. Well qualified & experienced teachers have been appointed, who are knowledgeable, capable of using innovative teaching methodology with a passion for their subject as well as providing knowledge, guidance and motivation to the pupils. Emphasis is put on study skills so that pupils become independent learners and become self-reliant. Excellence is fostered in a stimulating yet supportive environment and pupils learn to research and extend their knowledge, engaging in individual projects, group work and presentations. Extensive use is made of the library, as children are encouraged not only to read for pleasure but also to develop an appreciation of knowledge and literature and the activities designed by our expertise use of factual resources. The School possesses a large Library with a vast collection of books and encyclopedias and rich resources. Welcome to Sydney International School (SIS). 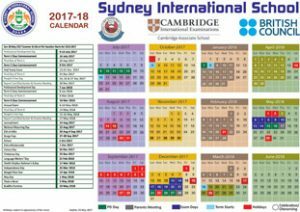 Sydney International School is pleased to offer international education from Play Group to O Level and has been in operation since 2012. Our school is well-known for providing progressive education and is an accredited member of Cambridge International Examinations. The founding Principal, Mr. Robert John Thompson, is an Australian citizen. He trained the teachers to use the activity based teaching methodology. Under the superlative guidance of our skilled education consultants our teachers have received a variety of teaching techniques. Under his supervision we start offering Cambridge Primary and Secondary Checkpoint and O Level Examinations for our students. Our school believes that the most valuable skill for the future is the ability to live, work and interacts in a multicultural environment. Our Open Days will take place from Friday 5th to Saturday 6th of March 2019. It is an opportunity that is open to prospective parents and students. This is an occasion for these parents to tour our school, visit classrooms, and ask questions. You are most welcome to invite your families and friends to our Open Days.